The last place Jocelyn Bloom wants to be is Mimosa Key but when the celebrated life coach is named the "other woman" in the highly publicized marriage breakup of Hollywood's sweetheart couple, she has no other choice. At least, she assures herself, she can hide out in Barefoot Bay, the tightly controlled resort owned by one of her college roommates, and won't have to go anywhere near her childhood home, where her estranged father resides, and the painful memories that await her there. Life, however, has other plans for Jocelyn. Will Palmer and Jocelyn Bloom were next door neighbors and best friends. Will knew Jocelyn's father, the local police chief, had a short fuse and his room above the garage was her safe harbor from the domestic abuse that nobody in town ever suspected. The summer after graduation, they were looking forward to bright futures - college and, hopefully, for Will, a career in professional baseball. They were also struggling with the deep attraction that had simmered between them, unacknowledged, for years until that final, sultry night when they began to open their hearts to the feelings that had always been there. But their happy ending was sidetracked by her enraged father and that night ended with devastating consequences, secrets, sacrifices and a separation that changed the course of both of their lives for the next fifteen years...until the morning Will arrives at Barefoot Bay where he works as a custom carpenter and discovers someone who isn't supposed to be there. Any doubt disappeared. Along with common sense and years of rationalization and a decade and a half of telling himself he had no choice - even though he knew differently. Everything suddenly changed at the sight of Jocelyn Mary Bloom. The sun was warmer. The air was cleaner. And his heart squeezed in a way it hadn't for fifteen years. The attraction between Jocelyn and Will is immediate, intense and as complicated as ever. Jocelyn is shocked to discover that Will not only has a close relationship with her father, Guy Bloom but that Guy in no way resembles the abusive father from whom she fled all those years ago. Suffering from Alzheimer's, he has become a sweet, if confused, old man who lives for reality television, thinks Will is his beloved son and is certain Jocelyn is the advance person for a home makeover show. To Jocelyn, he's the source of pain and deep, bitter feelings that have been her constant companion for the past fifteen years, the reason she keeps her emotions tightly controlled and refuses to lower the walls around her heart, the reason she sacrificed a possible happy life with the boy she loved to keep him safe from her father's brutality and the man she intends to stick in a nursing home as soon as possible. Will never intended to develop a friendship with Guy when he returned to Mimosa Key but the man living next door in no way resembles the person he used to be and slowly, over time, they began to forge a family and a love between them grew. All of that could be over in a instant, however if Jocelyn shares with Will what happened after she was dragged from his room all those years ago. Then there's the "other woman" charge. The Jocelyn he knew would never have involved herself with a married man. Has she changed that much or is there another reason she's refusing to publicly clear her name? 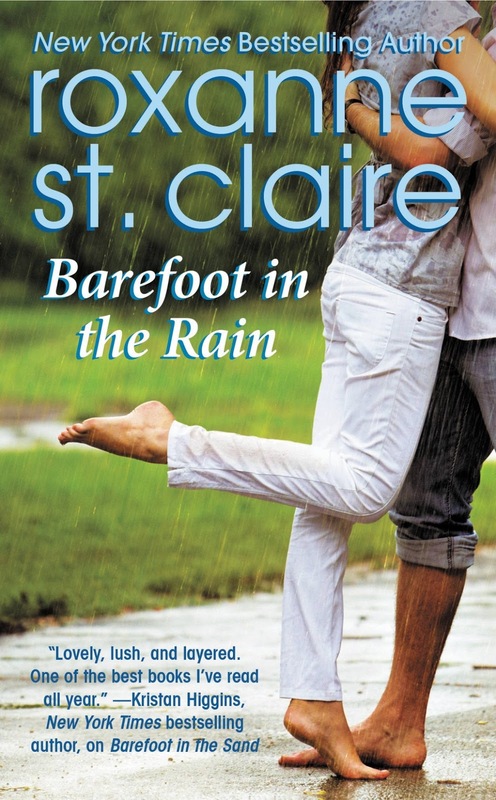 St. Claire has penned a deeply emotional story of second chances and choices; choosing to open one's heart to love, choosing to forgive - or not - and the choices we make when faced with the devastating disease that impacts so many of us. She doesn't pull any punches and I appreciated that. Is it possible to forgive someone who abuses us or someone who abuses someone we love? What if Alzheimer's robs that person of all their memories? What if it changes their personality; turns them into a sweet, loving man who would be shocked and devastated by his former actions? Tough questions. We all make choices in our lives and one of the most difficult choices a person can make is to forgive someone who has hurt them. That is one of the choices Jocelyn - and Will - will face in this deeply thought provoking story and the answers don't come easily. I'm a huge fan of Roxanne St. Claire's romantic suspense novels and, admittedly, was disappointed when she announced a change of course to contemporary/women's fiction. I should have had more faith in her. It really doesn't matter in what sub-genre she's writing. She consistently creates compelling, emotional, character-driven stories that keep me reading late into the night and refuse to leave my mind weeks after I turn the final page. I give Barefoot in the Rain my highest recommendation. It's not always an easy read - there will be tears and anger along with the laughter - and I'm sure not everyone will agree with the decisions Jocelyn and Will make but, as someone who has had first-hand experience with Alzheimer's, I found their journey - and decisions - realistic and their story (with a happy ending), immensely satisfying. This looks wonderful! One for the TBR pile! Thanks for sharing. Hope you enjoy it, Virginia. I already have my 2013 calendar marked for your next Dare Island book, Carolina Girl! I enjoy both romantic suspense and contempary stories. I'm curious about this one. The journey sunds inspiring! Na, I hope you enjoy the journey! 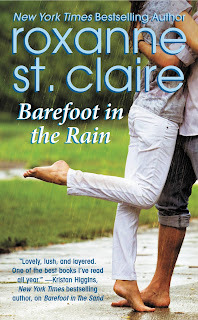 PJ I also enjoy Ms. St. Clare's novels, and loved the first Barefoot. I have personal experience with Altzheimers, and it's a heartbreaking disease . Thank you for your recommendation, I can't wait to read it! I just finished her new novella, Pick Your Poison, and loved it as well!! Looking forward to Barefoot In the Rain!!!! I agree, Pat. Alzheimer's is very heartbreaking and it's a disease that throws you for a loop on a daily basis. Glad to hear you enjoyed Pick Your Poison. I just downloaded it. I am currently reading Barefood in the Sand and am so happy Roxanne is writing this series. I can't wait to read Barefoot in the Rain. PJ, I really, really like the sound of this book. One of my grandmothers had Alzheimer's during the last 10 years of her life and I agree with you and others--it's heartbreaking. Thanks for the great review! I have never read Roxanne's works and I am so glad you stated that there is a happy ending, otherwise I would have been tempted to pass it up. Instead let me now trot over to Amazon and increase the size of my tbr by two! Dianna, it is definitely a romance with a romantic happy ending for our main couple but the journey to that place is not an easy one to be sure. Do you like romantic suspense? If so, I highly recommend St. Claire's Bullet Catcher and Guardian Angnelinos books. There should be a full list for both series at her website. Love her books and I really want to read this one because its different from her usual. Hope you enjoy it, Quilt Lady! I did read BAREFOOT IN THE SAND!! I will follow your recommendation to read BAREFOOT IN THE RAIN. It does sound serious. It deals with some serious topics, Laurie but it's not without its humorous moments too. I read another review for this novel yesterday and have decided I should pick this one up. Nice site! It's wonderful and cozy. Hi Musing Sallie! *waving* So lovely of you to stop by! Andrea and I both enjoyed meeting you at this year's M&M conference. Hope you enjoy Barefoot in the Rain. I think it's one of St. Claire's best. Thanks for an honest review. It looks like another new author for me. I'm looking forward to it.